Enjoy a visit just for your eyes with an exclusive guide. The tour begins in the Foyer area and continues up the main stairway, built with a judicious combination of materials of all kinds, featuring a whole world of details. Next, we visit the Lluís Millet Hall, a veritable architectural homage to nature. Finally, the tour culminates with a visit to the Concert Hall. An explosion of colours, shapes and light welcomes you to this grandiose recital of the decorative arts. 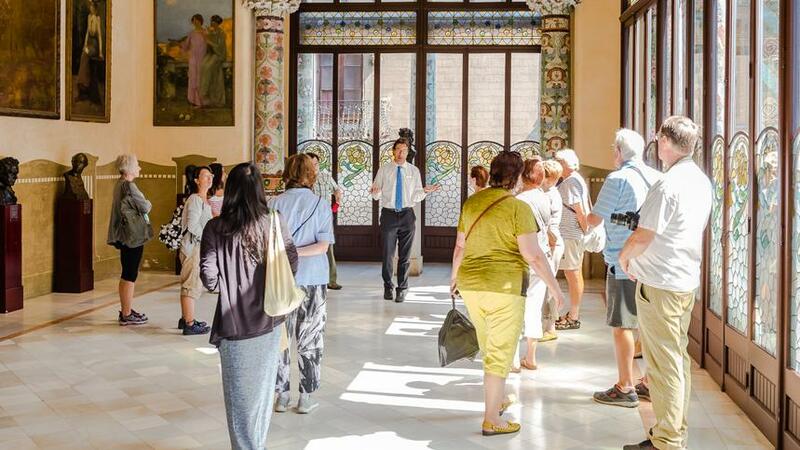 The tour also goes up to the second floor, next to the skylight - a drop of honey and water, a source of light and inspiration - before ending at the Palau organ, which overlooks the hall and accompanies the audience on a short musical journey. Regular visit times (from 10:00 to 15:30). If required, it is possible to arrange visits on other time schedules; ask us for availability. Dedicated guide, available in english, spanish, catalan, french, italian, portuguese, german, japanese, chinese and arabic. Consult prices and availability on the phone 902 475 485 or by email at visites@palaumusica.cat.